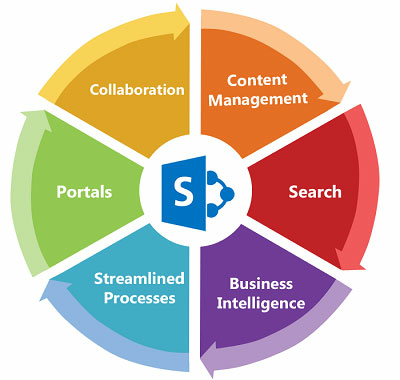 Microsoft SharePoint is the highly preferred platform for the development and hosting of enterprise level intranet and internet sites and web applications. The platform guarantees an extended and secure environment, which is basically designed for exceptional team association. This platform formulates the entire process effortless and unproblematic for managers to develop, design, and control the website. Creative Web Designer holds the highly professional and experienced team of certified Microsoft SharePoint developers that are talented and skilled in SharePoint Development. Our highly talented and qualified team of SharePoint developers gives high class revelation for each Microsoft office SharePoint server or MOSS. With our SharePoint development, we endeavor to facilitate you to shelter the web application below the most dominating platform of customer centric and high performance application. We have in-depth knowledge of Microsoft SharePoint and latest market trends and this enable us to successfully accomplish all entrusted projects using SharePoint 2013, SharePoint 2010, SharePoint 2007 (WSS 3.0/MOSS 2007), Office 365- SharePoint Online and more. At Creative Web Designer, we strive to render the most powerful and robust process of execution, content management, dynamic websites, decision making and data analysis by MOSS. Our SharePoint Development services allow our clients to efficiently enjoy the benefits of SharePoint deployment- optimizing and customizing the core capabilities of this platform. We have the right skills to offer a custom feel and look to the live sites of our clients by managing and optimizing the templates, custom site definitions, themes etc. Our SharePoint Development services promise to offer you with the most suitable and effective solutions within stipulated deadline and specific budget.